This topic shows you how to configure Azure App Service to use Microsoft Account as an authentication provider. Log on to the Azure portal, and navigate to your application. Copy your URL, which later you use to configure your app with Microsoft Account. Navigate to the My Applications page in the Microsoft Account Developer Center, and log on with your Microsoft account, if required. Click Add an app, then type an application name, and click Create. Make a note of the Application ID, as you will need it later. Under "Platforms," click Add Platform and select "Web". Under "Redirect URIs" supply the endpoint for your application, then click Save. Your redirect URI is the URL of your application appended with the path, /.auth/login/microsoftaccount/callback. For example, https://contoso.azurewebsites.net/.auth/login/microsoftaccount/callback. Make sure that you are using the HTTPS scheme. Under "Application Secrets," click Generate New Password. Make note of the value that appears. Once you leave the page, it will not be displayed again. The password is an important security credential. Do not share the password with anyone or distribute it within a client application. 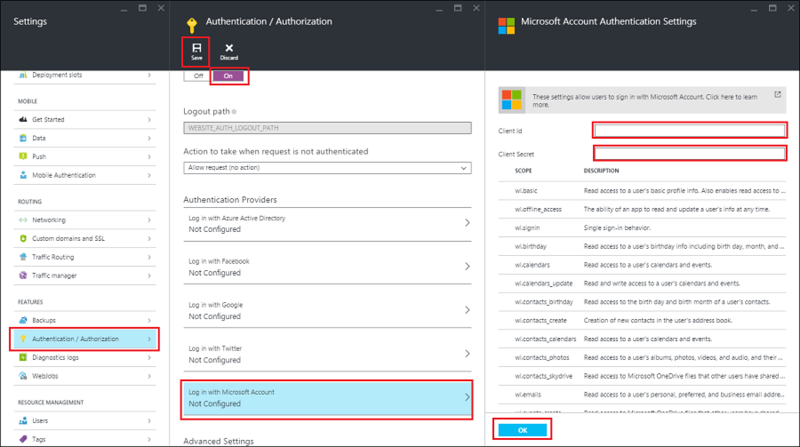 Back in the Azure portal, navigate to your application, click Settings > Authentication / Authorization. If the Authentication / Authorization feature is not enabled, switch it On. Click Microsoft Account. Paste in the Application ID and Password values which you obtained previously, and optionally enable any scopes your application requires. Then click OK.
By default, App Service provides authentication but does not restrict authorized access to your site content and APIs. You must authorize users in your app code. (Optional) To restrict access to your site to only users authenticated by Microsoft account, set Action to take when request is not authenticated to Microsoft Account. This requires that all requests be authenticated, and all unauthenticated requests are redirected to Microsoft account for authentication. You are now ready to use Microsoft Account for authentication in your app. Learn how to add App Service authentication to your mobile app.